Baseball elbow pain is a common occurrence in many sports, but the throwing motion and subsequent discomfort from baseball is a bit different than other athletic activities, and can be extremely damaging and unsafe. Baseball elbow pain can be felt along the inside and outside of the throwing elbow, which differs from other sports like tennis or golf in which pain is only felt on one side or the other. It can be severe enough that the person experiencing the pain may feel it at all times, not just during the act of throwing a baseball. During the act of throwing a baseball, the motion causes the muscles, tendons and ligaments on the inside of the elbow to stretch and those on the outside to compress, which creates a tension within the elbow. This can cause bone spurs or stress fractures, but typically the majority of the cases of pain are because of tendonitis or stress put on the ulnar collateral ligament. The pain is typically derived from overuse of the throwing arm. Tendonitis of the elbow occurs after a long off-season of not throwing and using the arm, or overexertion without proper care. It can be especially prevalent with young, developing players who use improper form. 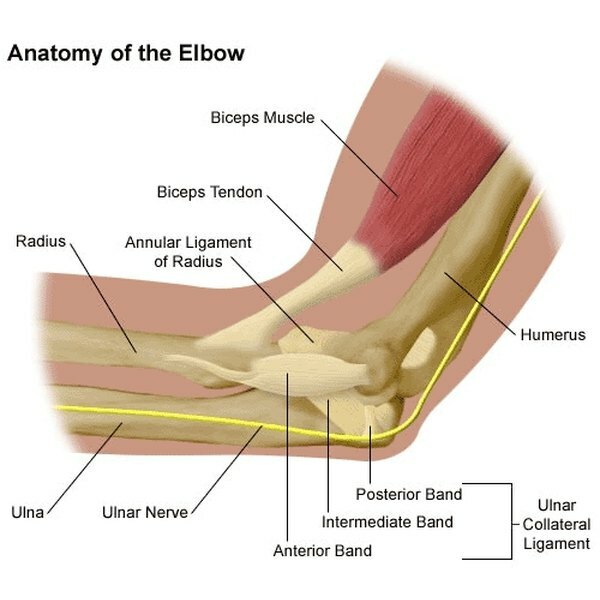 Players must take care of their throwing elbow after practices, games or any time after long periods of play, because the pain can become so unbearable that participating may be out of the question altogether. It is common for players to have elbow pain after an off-season and in the first few weeks of practices or games. It is typical for players to apply ice to their throwing elbow to keep down swelling of the muscles around the elbow, loosening it up and not allowing a stiffening to happen. This can either be done using cold packs, ice bags or applying ice directly to the elbow for short periods of time. Another of the simple remedies is to rest the arm. The only way that the muscles around the elbow will completely return to their regular state is for the arm to be rested and not be used in baseball activities. This is usually not a possibility during practices or during the season, but the only way to truly relieve the strain on the muscles, tendons and ligaments is to give them some time to heal. This is why in Major League Baseball, a four-day rest period is allotted for pitchers between each of the starts. If the pain gets to the point that it is not being cured or slowed by the common practices, it is usually suggested to see a doctor before serious damage is done. In very severe cases, surgeons may perform an operation known as Tommy John surgery. With this type of surgery, the ulnar ligament is replaced with one from another part of the player's body. This, however, is obviously expensive and takes a long course of rehab. Bradley Schjoth is a college student aiming for a degree in radio, television and film from University of Wisconsin, Oshkosh. His articles specialize in his academic interests, as well as politics, technology and sports. He writes for Wisconsin Combat Sports and is the Interim Managing Editor for Citizen Wausau.